All good things must come to an end, and unfortunately that's the case with many of the federal tax credits for making your house more energy efficient. However, if you're thinking about installing insulated vinyl siding on your home, there may still be some help available. The Vinyl Siding Institute reports that there are a few state and local programs in place that could provide a little financial assistance for your project. If you think that rebates and low-interest loans to lower your utility bills sound like a pretty good deal, you can find out if your area has a program and whether you're eligible. The EPA estimates that an average home in Arizona could realize an 18 percent reduction in energy usage if built to International Energy Conservation Code specifications. If it's a home being constructed, the costs to meet the IECC standards might add up to an additional $1,517. The homeowners could recoup those costs in about 3.9 years in the form of energy saving -- after that point, it's money in their pockets. The potential savings varies by region, but making your home more energy efficient is almost always a good investment. 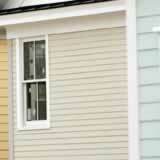 One of the easiest ways to get started is by installing insulated vinyl siding. The IECC recommends that a home's exterior walls should have an R-value that ranges from R-13 for milder regions to a hefty R-25 for cold weather zones. Virginia -- The Richmond Regional Energy Alliance offer rebates of up to $500 for homeowners in certain jurisdictions who perform energy upgrades. Illinois -- You may be eligible for an Energy Impact Loan if you lower your home's total energy usage by 15 percent or more. The insulated siding must be approved by an energy auditor and installed by an Energy Impact-certified contractor. Maine -- Installing insulated vinyl siding may be an improvement that makes you eligible for a Maine Property Accessed Clean Energy or PowerSaver loan. Nebraska -- Upgrading to insulated siding is one of the remodeling projects that can make you eligible for a Nebraska Dollar and Energy Savings loan. The siding must be approved to qualify for the assistance. California -- If insulated vinyl siding is installed as part of a whole house energy efficiency upgrade, you may be eligible for a California Homebuyers Fund loan. These are just a few of the programs that may help you realize the savings that making your home more energy-efficient can provide. Check with your state, local jurisdiction, and regional utility companies to see what other programs may be available in your area. If you're counting on the assistance, always verify that the insulated siding you plan to use is an eligible upgrade before your proceed with your project.